For today and the next couple of Tuesdays, I'm going to be sharing with you some of the shorter posts in my series on throwing a cheap and easy DIY Western Party. Today's project: invitations. (Okay, okay, this is longer than the usual Two-Minute Tuesday post, and these will take longer than a couple minutes to put together, but they are pretty quick). The first thing in throwing a party is sending out invitations, right? They set the tone for the party and help guests know the theme and what to expect. Invitations can be expensive and time-consuming, but fortunately these darling invitations don't fall into either of those categories. To make these invitations, I bought some decorative 8.5 x 11" scrapbook paper. Each sheet of paper yields two invitations, so I bought half as many sheets as invitations I wanted to send out. I chose a bandana print paper and a beige-y paper that I thought looked the most like an old, worn, Wanted poster. I bought 8 of each to make 16 invitations, and I also bought a spool of twine. That's all you need for these invitations (plus a printer and a little glue). See end of post for the price breakdown! 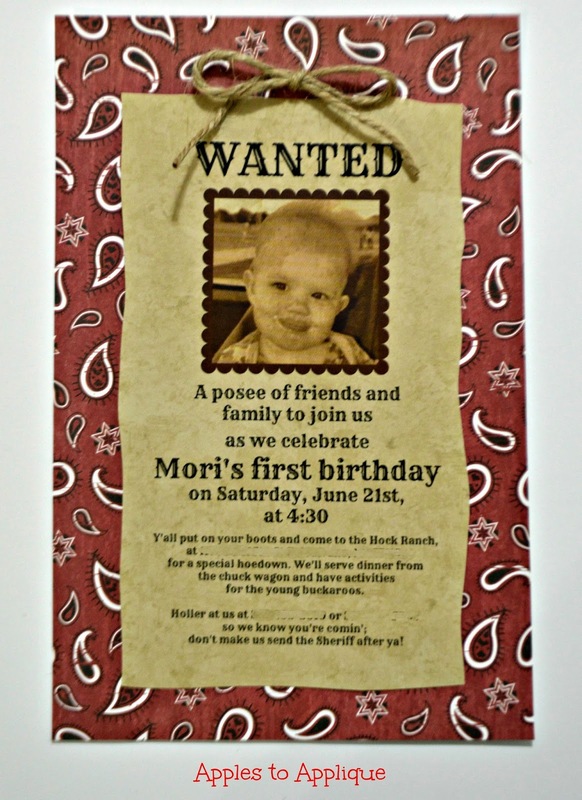 I found a funny picture of my daughter that I liked and designed the invitations using PicMonkey. (I'm not an affiliate with them or anything--although I wish!--they just have a great free program). I chose their "design" option, selected the transparent canvas, and added in the picture and text (see my wording below). I was even able to use their program to give my picture a sepia tone. Easy peasy. (Note: this is super embarrassing, but I misspelled "posse" on her invitations. The spelling below is correct). Y'all put on your boots and come to the (last name) Ranch at (address) for a special hoedown. We'll serve dinner from the chuck wagon and have activities for the young buckaroos. Holler at us at (phone number) or (second phone number or email) so we know you're comin'; don't make us send the Sheriff after ya! Once I had the text and picture laid out the way I wanted, I saved the image. I used Microsoft Word to paste two of the invitation images side by side, and then printed them out on my beige paper. Next, I cut down the middle between the two images. Then I trimmed off about 1/2" more from around all of the edges, cutting in a wavy line to mimic the look of an old Wanted poster. I also tried burning the edges with a lighter, but it didn't work so well with the scrapbook paper. Oh well, you never know unless you try. I cut the bandana paper in half. After that, I simply glued the Wanted poster part on to the bandana paper. Then I made a little bow with twine and glued that on. Ta-da! That's all it takes to make these darling invitations. So simple, and yet they look like they could have been special ordered from someone's Etsy shop. Wasn't that quick and easy? Now here's the best part: the price breakdown. This series is all about throwing a DIY Western Party for cheap, after all. The sheets of scrapbook paper cost 59 cents a piece, but I got them for 40% off, making them 35 cents a piece. Half of a beige sheet and half of a bandana sheet was used for each one, so the cost of each invitation was equivalent to one whole sheet--or 35 cents each. The entire huge spool of twine cost $1.99 at Walmart, and I used a very tiny amount of it for each one. Let's say it was 5 cents worth of twine (although I doubt it was even that much), that brings the total to 40 cents for each invitation. Add in maybe 10 cents of ink for each one (which is probably being generous), and you're looking at a grand total of 50 cents for each invitation. Not bad, huh? I hope this inspires you to make your own birthday party invitations. Keep checking back over the next couple of weeks for more cheap projects you can do yourself to put together a darling party. Make sure you don't miss a post in this series; subscribe to my email list and follow me on social media. The buttons are at the top-right corner of my blog. Thank you! I thought they turned out really cute, and they were so easy! This is the greatest! Turned out so cute! I'm glad you liked them. I'm thankful for the internet when it comes to planning parties; it's such a great resource for ideas! Thanks, Julie! I had fun putting them together. Those are super cute! You should sell those in your shop! I can totally see people where I live buying those. Thanks! I bet I could sell them! I always wonder why people would buy things that are so simple to make, but I know there's a market for it. I guess a lot of people don't have the time or inclination to make things. so cute!! And VERY western! Love!! Thanks, Jennifer! I'm super happy with them. Did you have to mail any of them? If so, what size envelope did you use?